“Spaghetti Junction” is a four-level interchange joining Interstates 85 and 285 in northern Dekalb County. The Georgia Department of Transportation (GDOT) named the junction after Tom Moreland, a former GDOT Commissioner and Chief Engineer. Photo taken July 5, 2014. Interstate 285 forms a beltway around the city of Atlanta through Cobb, Dekalb and Fulton Counties in north Georgia. 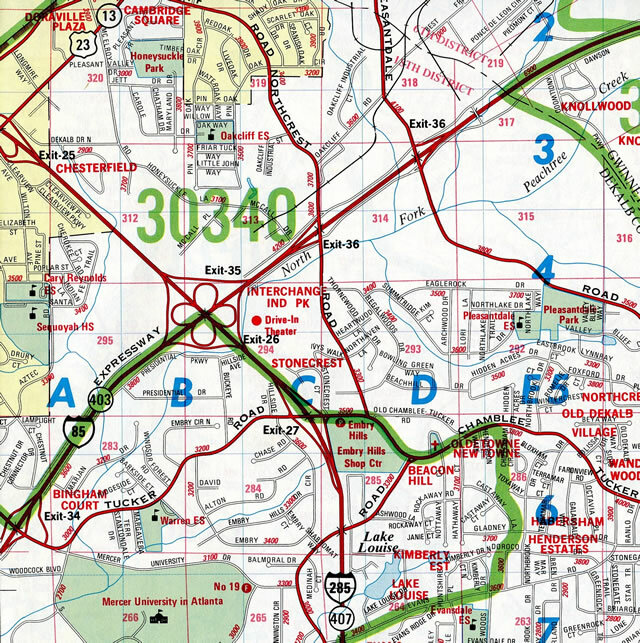 The mostly urban route runs north-south through western reaches of the city while entering East Point, College Park, Forest Park, Doraville and Sandy Springs. Originally intended to allow through traffic to bypass the city, the freeway is heavily used by local traffic as a result of suburban growth. Atlanta has been fast growing for decades now, and area development has reached far beyond the scope of the Atlanta Beltway. Many corporations established their presence near beltway interchanges, as opposed to center city. This can be seen in the many high-rise buildings along the northern portion of I-285 through Sandy Springs. Eastbound Interstate 285 passes through a pair of tunnels, totaling 1,500 feet in length, on the south side of Hartsfield-Jackson Atlanta International Airport (ATL). Photo taken April 13, 2012. Remaining portions of Interstate 285 to open in 1969 included between Exits 40 (Ponce de Leon Avenue) and 32 (Chamblee Tucker Road) in Dekalb County and Exits 12 (U.S. 78 &amp; 278) and Exit 19 (U.S. 19) between west Atlanta and Cobb County. A number of other freeways may have alleviated traffic in the Atlanta area had they been constructed. 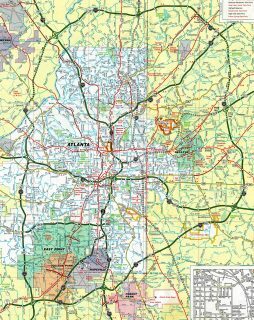 Of ones shown here, Georgia 400 between I-285 and I-485, I-485 east of Boulevard, and Georgia 410 between I-485 and U.S. 29 & 78 (Lawrenceville Highway) were never built. Prior to the “Freeing the Freeways” upgrade, the exchange connecting Interstates 85 and 285 in Dekalb County was simply a full cloverleaf interchange. Today this junction is commonly known as “Spaghetti Junction”. Interstate 285 straddles the Tucker city line northward to Henderson Road. A long c/d roadway (Exit 33) branches away from the freeway mainline a short distance beyond there for Interstate 85. Photo taken by Chris Patriarca (02/23/03). The c/d roadway to Spaghetti Junction (Exit 33) lines the beltway north through the subsequent interchange (Exit 32) with Chamblee Tucker Road. Photos taken by Chris Patriarca (02/23/03). Two lanes continue along the c/d roadway below Chamblee Tucker Road. The succeeding split takes motorists onto a high flyover for I-85 south toward Buckhead in Atlanta and north into Gwinnett County. Photo taken by Chris Patriarca (02/23/03). Interstate 285 arcs southeast from Dunwoody through Doraville on the 2.25 mile approach to Exit 33 with Interstate 85. SR 141 (Peachtree Industrial Boulevard), a freeway leading northeast to Norcross, meets the beltway at the ensuing exit. Photo taken 07/02/17. Advancing south by the site of the Doraville GM Plant, the inner loop of I-285 approaches U.S. 23 (Exit 32) and Interstate 85 (Exits 33A/B). U.S. 23 (Buford Highway) parallels I-85 southwest to Chamblee and northeast to Norcross, Duluth and Suwanee. Photo taken 07/02/17. A collector distributor roadway stems south from the parclo interchange with U.S. 23 & SR 13 (Buford Highway) to the four-level interchange (Spaghetti Junction) with Interstate 85. The c/d roadway also connects with Chamblee Tucker Road, a surface arterial south of the exchange. Photo taken 07/02/17. Two lanes depart from the inner loop of Interstate 285 for both I-85 (Northeast Expressway) south into Atlanta and I-85 north toward Lawrenceville, Gainesville and Greenville, South Carolina. Photo taken 07/02/17. A high flyover takes motorists from I-285 south to a c/d roadway along Interstate 85 north ahead of Northcrest Road. Express toll lanes line Interstate 85 northeast to the split with I-985 and SR 20 near Buford. Photo taken 07/02/17. Sequential exit numbers for Georgia 141 and Interstate 85 along I-285 east (inner). This set of button copy signs was replaced during the statewide change to mile base exit numbers in 2000. Photo taken 04/95. The c/d roadway for Exit 33A expands to four lanes, with full access to both Interstate 85 and Chamblee Tucker Road for traffic entering the Perimeter Highway from U.S. 23 (Buford Highway). Photo taken by Chris Patriarca (02/23/03). One and a half mile ahead of the Tom Moreland Interchange (Exits 95B/A) with I-285 on Interstate 85 south. All through trucks are directed to use the Perimeter Highway in lieu of I-85 and the Downtown Connector. Photo taken by Carter Buchanan (08/10/13). A distributor roadway (Exit 95B) separates from I-85 south just beyond the Pleasantdale Road overpass for the outer loop of Interstate 285 to Dunwoody, the Perimeter Center and Sandy Springs. Photo taken by Carter Buchanan (08/10/13). Succeeding lane drops take place along Interstate 85 south for Exits 95B/A (I-285), with through traffic reduced to four general travel lanes and a Express Toll Lane inbound to Atlanta. Photo taken by Carter Buchanan (08/10/13). The distributor roadway (Exit 95B) to Interstate 285 west travels at grade level through Spaghetti Junction. The ramp splits with access to a c/d roadway for U.S. 23 (Buford Highway) at Doraville and the beltway west to I-75 at Smyrna. Photo taken by Carter Buchanan (08/10/13). A two lane flyover (Exit 95A) shuttles motorists southward onto Interstate 285 ahead of Tucker. 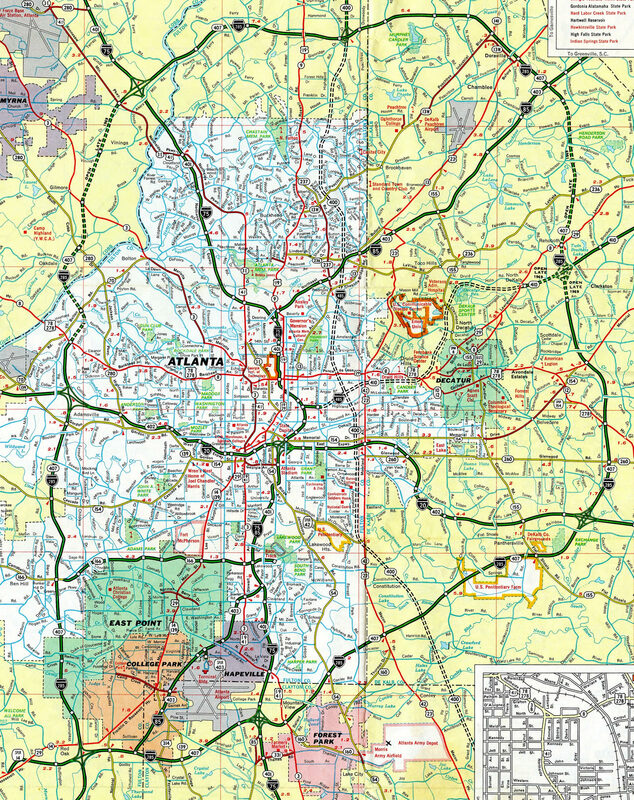 I-285 navigates through Dekalb County to Clarkston, Avondale Estates and Panthersville, where it meets Interstate 20. Photo taken 07/13/05. Interstate 285 travels 19 miles south from Exit 95A to Interstate 675 and 28 miles to converge with I-85 again at College Park. Photo taken 07/13/05. Two miles south of the Tom Moreland Interchange (Exit 95) with Interstate 285 on I-85 north at the Shallowford Road overpass by Chamblee. Photo taken 04/13/12. Interstate 85 advances one mile north from the diamond interchange (Exit 94) with Chamblee Tucker Road to Spaghetti Junction with I-285. Photo taken 04/13/12. A series of office buildings and business parks line both sides of Interstate 85 to the exchange with the Atlanta Beltway. I-285 arcs northwest through Doraville to Dunwoody and south to Tucker and U.S. 78 (Stone Mountain Freeway). Photo taken 04/13/12. Exit 95 carries all traffic in unison from Interstate 85 north for the Perimeter Highway inner loop to Interstate 20 east and Augusta and the outer loop to Interstate 75 north and Chattanooga. Photo taken 04/13/12. Diagrammatic sign outlining the two lane flyover for Interstate 285 north and the lower ramp for Interstate 285 south. Both ramps tie into c/d roadways along the Perimeter Highway. Photo taken 06/21/05. Two miles north of Interstate 85 (Exit 61) on I-285 southbound. The succeeding two exits of the beltway southbound serve the city of College Park. Photo taken 07/13/05. 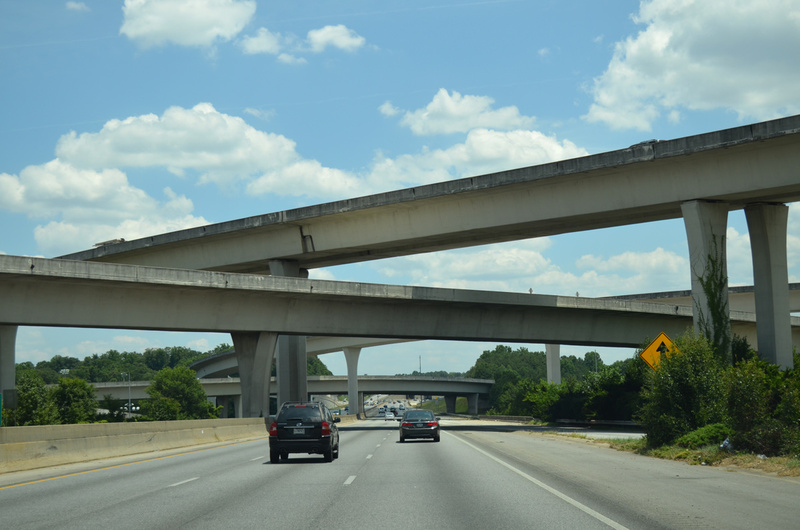 In addition to connecting Atlanta with Montgomery, Interstate 85 south also serves the city of Columbus and Fort Benning via connections with Interstate 185. Photo taken 07/13/05. Ramps to Interstate 85 depart just after the Interstate 285 ramps to the westbound beginning of Georgia 14 Connector (South Fulton Parkway). Georgia 14 Connector was designated as Georgia Spur 14 prior to 2007. Photo taken 07/13/05. Exit 62 forms a collector distributor roadway for both the outer loop of Interstate 285 and the northbound lanes of I-85 to Georgia 279 (Old National Highway). I-285 turns east otherwise to run along side I-85 in a dual freeway configuration. Photo taken 07/13/05. Interstate 285 curves east with three through lanes as Exit 61 separates for Interstate 85 south to Montgomery, Alabama and the parallel northbound lanes of I-85 to the Domestic Terminal of Hartsfield-Jackson Atlanta International Airport (ATL). Photo taken 07/13/05. Two lanes continue south from Exit 61 to join Interstate 85 ahead of Union City and Fairburn. I-85 ends in 149 miles at Interstate 65 outside Downtown Montgomery. Photo taken Photo taken 07/13/05. 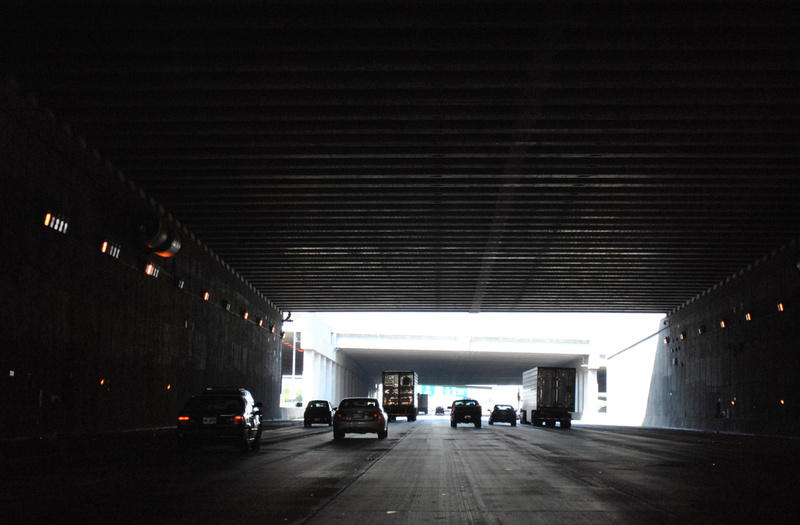 Interstate 285 angles southwest and passes under a pair of tunnels below the 5th Runway of Hartsfield-Jackson Atlanta International Airport (ATL), 1.5 miles prior to meeting Interstate 85. Photo taken 06/30/17. Exit 60 departs from the inner loop of Interstate 285 one mile ahead of I-85. Georgia 139 meanders west and north to meet Interstate 85 by parking facilities of ATL Airport. Photo taken 06/30/17. Two lanes part ways from Interstate 285 west for I-85. West from their three wye interchange (Exit 61), a dual freeway setup sees the roadways of I-85 running in between the roadways of the Perimeter Highway. Downtown Atlanta is 14 miles to the northeast at this point. Photo taken 06/30/17. A third ramp from Exit 61 emerges to join a c/d roadway accompanying Interstate 85 north to both SR 139 (Riverdale Road) and North Terminal Parkway to the Domestic Terminal of ATL Airport. Photo taken 06/30/17. Interstate 285 advanced westward with five lanes from Airport Loop Road toward Georgia 139 (Exit 60) and Interstate 85 (Exit 61). Photo taken by Chris Patriarca (02/23/03). One and a half mile east of the three-wye interchange (Exit 60) with Interstate 85, I-285 curved westward around the periphery of ATL Airport. Completed in 2006, the 5th Runway project since added two tunnels to the Atlanta Beltway on this stretch. Photo taken by Chris Patriarca (02/23/03). The Perimeter Highway bends northward from the parclo interchange (Exit 60) with SR 139 to the exchange with Interstate 85. The bridge mounted sign for SR 139 was removed by 2007, but a replacement was added for it and I-85 by May 2016. Photo taken by Chris Patriarca (02/23/03). An array of sign changes were made throughout Atlanta to reflect the opening of the International Terminal for ATL Airport. These included new overheads for I-85 north, directing motorists to the Domestic Terminal. Photo taken by Chris Patriarca (02/23/03). Two lanes partition from the beltway inner loop for Interstate 85. Travelers taking I-85 south will reach Columbus (via Interstate 185) in 93 miles and the Alabama capital city in 146 miles. Photo taken by Chris Patriarca (02/23/03). Interstate 85 south makes a gradual S-curve from the Domestic Terminal of Hartsfield-Jackson Atlanta International Airport (ATL) to Exit 70 with the Perimeter Highway. I-285 uses the control cities of Macon and Birmingham for the connections with I-75 south and I-20 west respectively. Photo taken by Chris Patriarca (02/23/03). Georgia 139 (Riverdale Road) takes a circuitous route around the southwestern boundary of ATL Airport, connecting with both Interstate 85 at Exit 70 and the Atlanta Beltway at Exit 60. Photo taken by Chris Patriarca (02/23/03). Back to back off-ramps depart from Interstate 85 south for both Georgia 139 (Riverdale Road) and the Perimeter Highway). Interstates 85 and 285 parallel one another for 1.6 miles without directly overlapping. The two routes were separated during the “Freeing the Freeways” project from 1982 to 1988.7 Photo taken by Chris Patriarca (02/23/03). Exit 70 separates from the southbound mainline of I-85 to form a c/d roadway from SR 139 southwest to both the inner loop of Interstate 285 and SR 279 (Old National Highway). Photo taken by Chris Patriarca (02/23/03). Traffic taking Exit 70 partitions into a flyover for Interstate 285 east (outer) to Forest Park and Dekalb County, I-85 south to Union City and Fairburn, and SR 279 (Old National Highway) to College Park. Photo taken by Chris Patriarca (02/23/03). Button copy overheads previously positioned above the ramp split for the Interstate 285 east and westbound mainlines, and the c/d roadway for SR 279 with return access to I-85 south from SR 139. Photo taken 04/95. Diagrammatic sign posted two miles ahead of the directional cloverleaf interchange (Exit 68) with Interstate 285 and SR 14 Connector (South Fulton Parkway) on I-85 north at the Flat Shoals Road overpass. Photo taken 06/21/05. Interstate 85 curves northward on the one mile approach to Exit 68 with Interstate 285 and SR 14 Connector (South Fulton Parkway) west. The freeway maintains three through lanes for the Domestic Terminal of ATL Airport and Downtown Atlanta. Photo taken 06/12/05. Nearing the split with Exit 68, guide signs for Interstate 285 reference the beltway as the Atlanta Bypass. The Perimeter Highway doubles as both a heavily traveled commuter and freight corridor throughout the Atlanta metro area. Photo taken 06/12/05. The sequential exit number of the south junction of Interstates 85 and 285 was Exit 15. All Interstate exits in Georgia were renumbering to use a mile based system in 2000. Most remaining button copy signs were replaced during the statewide resigning, including this overhead by the Flat Shoals Road overpass in August 2000. Photo taken 12/07/99. Exit 68 branches away from I-85 northbound for Interstate 285. A subsequent flyover departs for Georgia 14 Connector west. Georgia 14 (South Fulton Parkway) stems west from the Perimeter Highway as a freeway to U.S. 29 (Roosevelt Highway) near Red Oak, College Park. Photo taken by Chris Patriarca (02/23/03). 2012 sign replacements made at the Exit 68 ramp separation replaced Tampa with the International Terminal for ATL Airport for I-285 east (outer). The International Terminal opened to passengers in May 2012. Photo taken by Chris Patriarca (02/23/03). Button copy guide signs for Exit 68 used Augusta in place of Tampa for I-285 east, and referenced the beltway as a Bypass Route. Photo taken 12/07/99. Together with the c/d roadways, six roadways pass below the SR 279 (Old National Highway) overpass, with I-85 occupying the inner roadways. Photo taken 06/12/05. Button copy guide signs previously directed traffic from the ending Georgia 14 Spur (South Fulton Parkway) east to the loop ramp for I-285 north (inner) and the c/d roadway for Interstates 85/285 east to Georgia 279 (Old National Highway). Photo taken by Jim K. Georges (07/98). “New report puts dates on start of Outer Loop.” The Atlanta Journal and The Atlanta Constitution, October 22, 1992. “Outer Loop on back burner again.” The Atlanta Journal and The Atlanta Constitution, November 5, 1992. “Northern arc through Cherokee endorsed by Barnes.” Cherokee Tribune (Canton, GA), January 16, 1999. 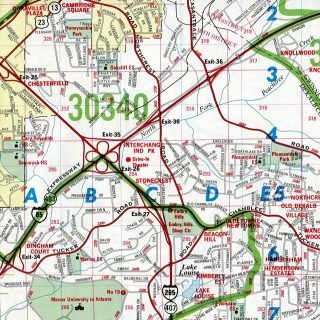 “Counties eye Arc right-of-way – Gwinnett floats parkway plan.” The Atlanta Journal and The Atlanta Constitution, February 20, 2003. “I-75, I-285 on north side to be widened … again.” The Atlanta Journal and The Atlanta Constitution, May 28, 1986. “Light at end of the tunnel for Interstate 85 construction.”” The Atlanta Journal and The Atlanta Constitution, September 17, 1987.